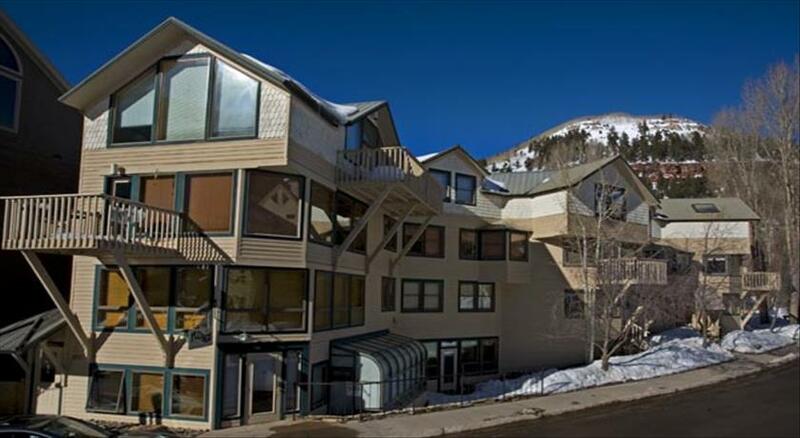 The Plunge Condominiums offer two bedroom condominiums conveniently located in the heart of Telluride. 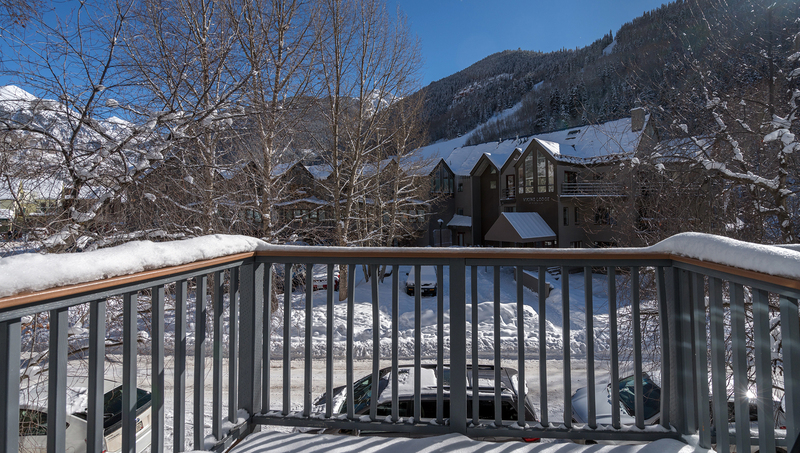 Located one block from Lift 7 and four blocks from the downtown area, the Plunge offers great views and decks. 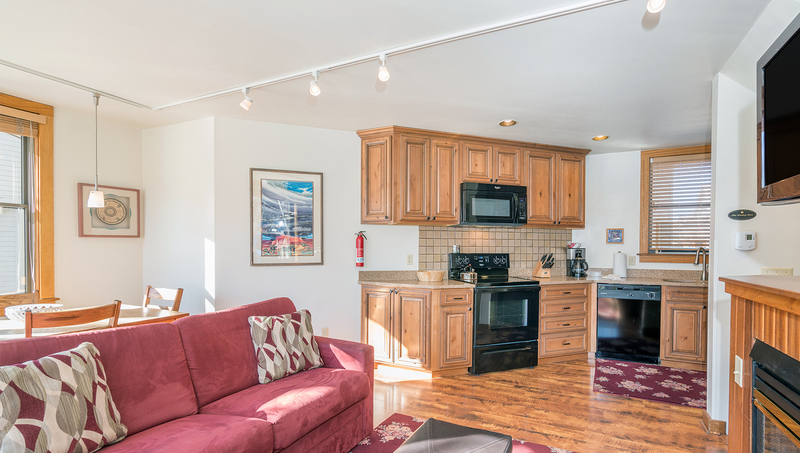 Plunge Condominiums sit right on the banks of Cornet Creek and 1 block from Lift 7. The townhouse-style layout makes the most of views and space. Bedding: Split king bed, queen bed, full sofa sleeper. 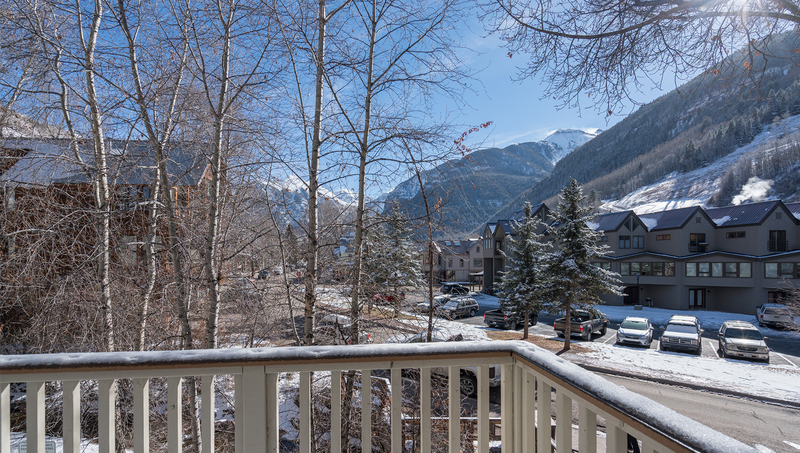 The fantastic deck on this condo is great in the summer and winter, while its location is convenient to everything in town, and less than a block from Lift #7. Entry is on the ground level, with ski rack just inside the front door. Up one flight, there is a small sitting area with gas fireplace, flat-screen TV w/VCR and DVD, full-sized sofa-sleeper, a full kitchen and dining table that seats 6. There is a deck off of the living room with great views of the Box Canyon. The 1st bedroom is on the ground floor, with a queen bed, flat-screen TV with USB port, and bathroom on the hall with shower-tub combo. Then up one more flight from the living room is the master suite with king bed which can be split into 2 twins, jacuzzi tub, and private bath with shower only. There is also a back entrance off this bedroom. This condo has its own washer/dryer and wireless Internet. Limited complex parking is available in the back lot. The free in-town shuttle bus stops at the corner across from the condos. Siam (Thai restaurant), the popular There bar for cocktails and tapas and Wine Mine liquor store are also on that corner, while the historic downtown of Telluride is just 4 blocks away. Town Park with the festival grounds is 5 blocks straight down Pacific Avenue, and the San Miguel River Trail is a few steps away. The base of Lift #7 (Coonskin Lift) is less than a block to the west. So everything is within a 10-minute walk. Hiking, biking, and jeeping trails start right from town and offer destinations including historic mine sites, ghost town, waterfalls (4 named ones), and even 14,000-foot peaks (Sneffels being the closest). Winter adventures of ice skating, cross-country skiing, and sledding can be found in the Town Park, with groomed Nordic track. 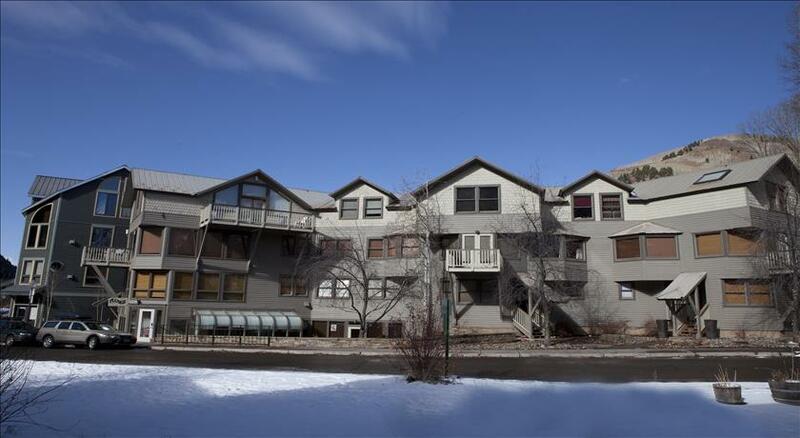 This condo is a perfect choice, whether your pleasure is a fun winter vacation or a peaceful summer visit. 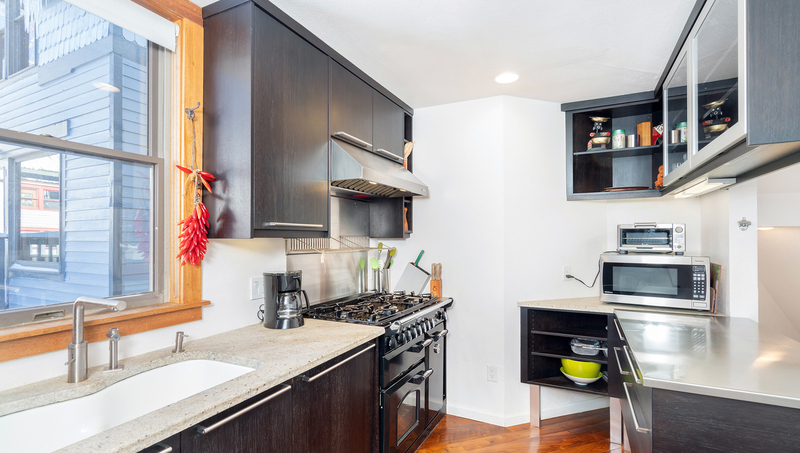 This three-story two-bedroom townhome is perfect for a group who loves to spend time in the kitchen. 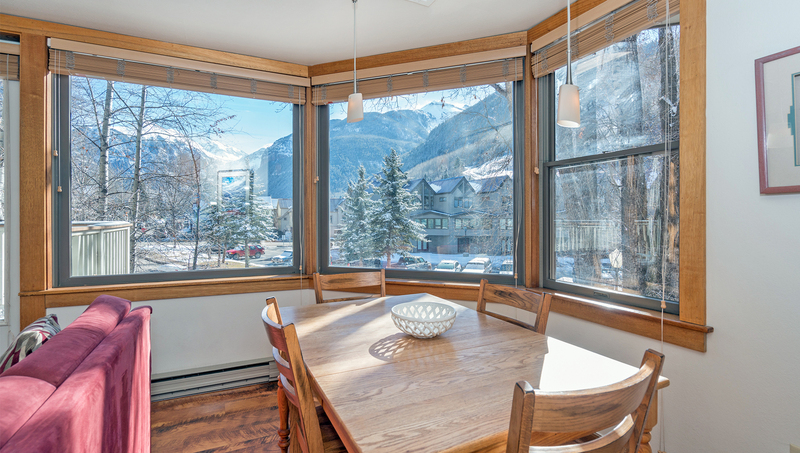 The attractive wall art, walnut floors and its prime location in downtown Telluride just steps from the river trail and ski lifts also add to this unitâ€™s appeal. Bedding: Queen bed, two twin beds (can be made into a king) and a double sofa sleeper. Sleeps 6. 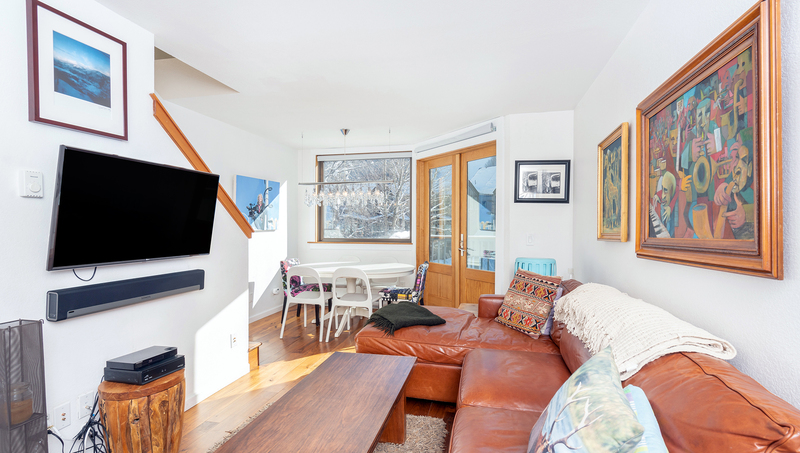 Upon entering this townhome, youâ€™ll find a foyer with room to store skis, boots and other hiking gear. A bedroom is located on the first floor with two twin beds that can be converted into a king. The room also has a TV with a VCR, iPod dock with radio and bluetooth, and plenty of games and videos for guests to use. There is also a bathroom located on the first floor. It features a jetted tub with a shower, an Italian marble sink, and private laundry. On the second story, guests are welcomed into a light and airy living space with a kitchen, dining room and sitting area. 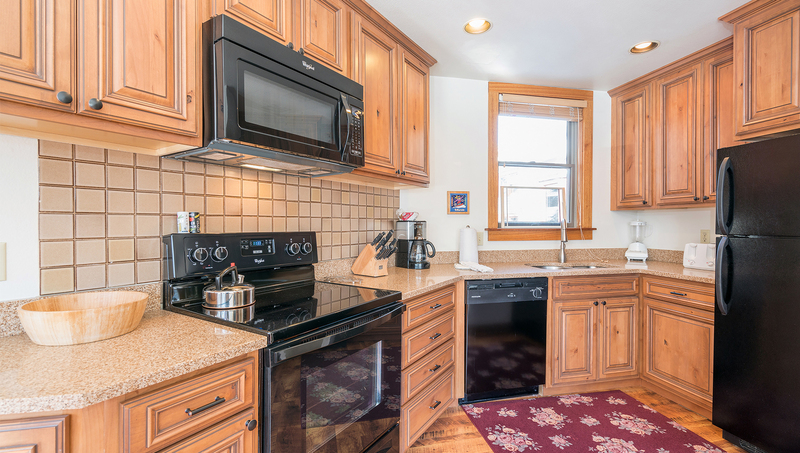 The kitchen is the gem of this property, with an AGA five-burner gas stove, three ovens, commercial-grade vent hood and racks, a stainless steel prep island and granite countertops. Even if you donâ€™t like to cook, youâ€™ll be tempted in this kitchen. 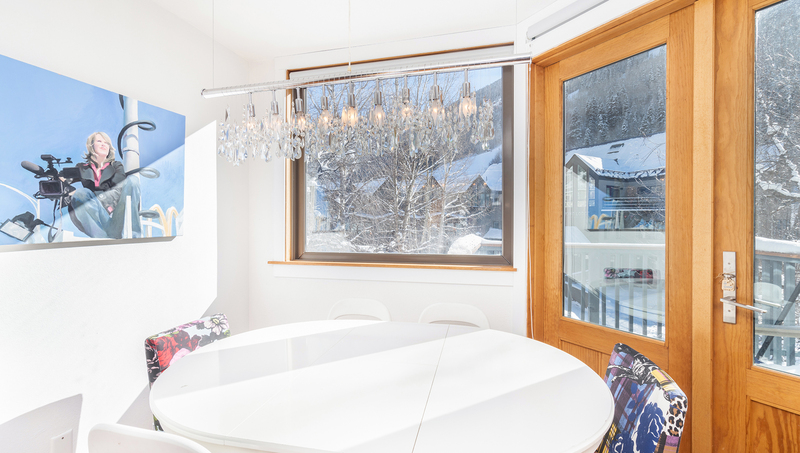 The dining table, which is situated under a very unique light fixture, can seat up to six people. The dining room is open to the living room, which has a pull-out double sofa sleeper situated in front of a large flatscreen TV with a blu-ray player. 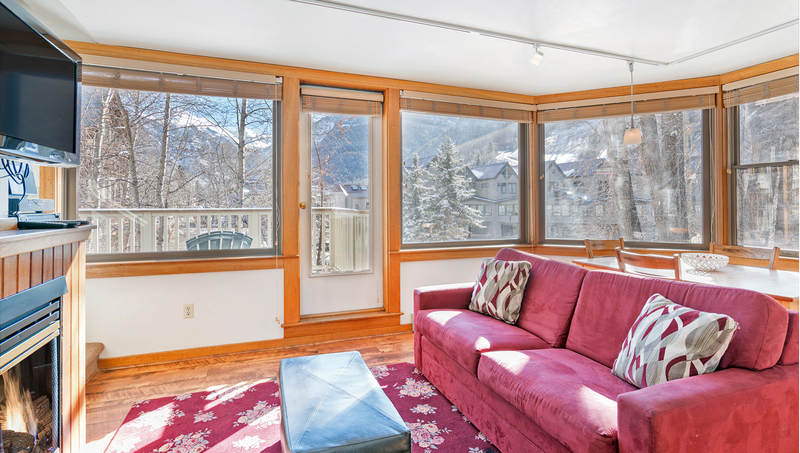 There is also a balcony off of this room, which has a loveseat swing and stellar views of Ballard Mountain and the surrounding peaks. The master suite is on the third floor of this unit. The bedroom features a queen bed and ensuite bath with an italian marble tiled steam shower and matching basin. A skylight adds to the charm of this bedroom, which also has a double futon and a TV. 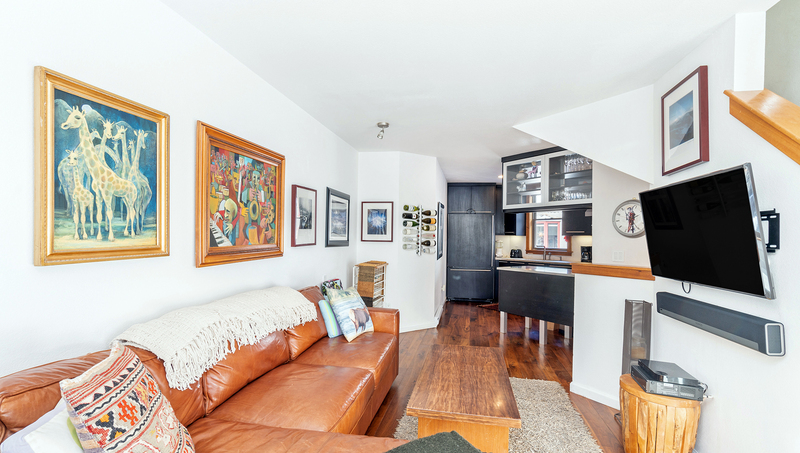 This condo has wifi and parking. It is located across the street from the river trail and Â½ block from Lift #7. 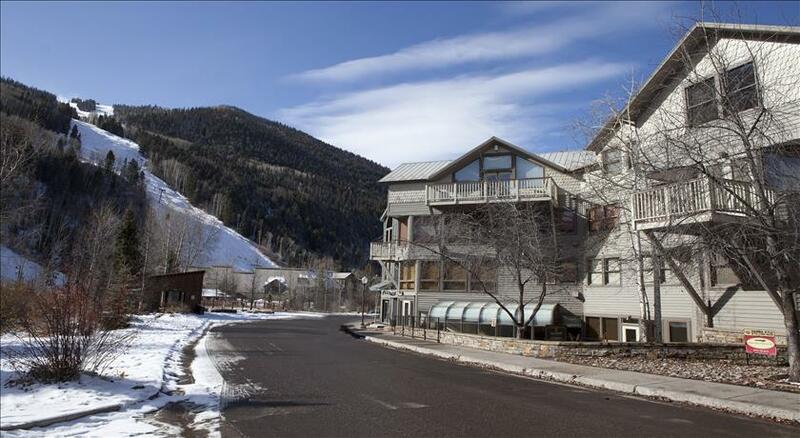 It is only a five-minute walk to the gondola and 15-minute walk to Town Park.